I couldn't make it last week but things still ticked along without me. I hear a couple of new guys came and brought Relic with them. The game came down to a race between Steve and Dan to roll a 6 and win the game. 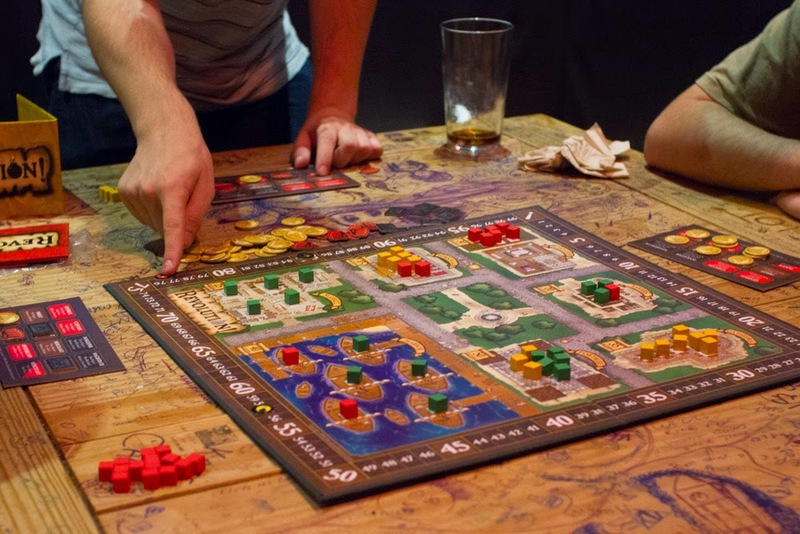 In order to finish the game because closing, everyone else forfeited their turns. Steve ended up rolling the 6 before Dan. This week was a bank holiday which always has a low turn out but we still managed to muster around ten people. We started off with Dice Dual. We had an odd number of people so my team had 3 people and the opposing team had 4. This meant I was not only the captain but also in charge of engineering. This is almost an impossible task and for the most part I left it up to the other players to decide on where they placed their dice. Unlike the last games we had played, this game lasted longer and seemed more tactical. To the layman observer it might have looked like we knew what we were doing. In truth we were frantically rolling dice and trying to make our ship go vaguely where we wanted it to. My team ended up taking the victory but I don't think we can take all the credit, at one point our enemies teleported themselves onto a mine they'd placed earlier. During Dice Dual a few more people arrived and we split off, playing Train, Revolution and Alien Frontiers. I played Trains. Everyone started off in different areas of the board and there was very little crossover of people on the same space. Towards the end of the game I'd built myself a pretty good engine of the cards and bought myself a bunch of skyscrapers. Adam ended the game by building the last station but it was too late, I'd got myself a run-away lead and finished with the top score. In Alien Frontiers it looked like the game belonged to Dan, but just at the last minute Corey took the lead from him. 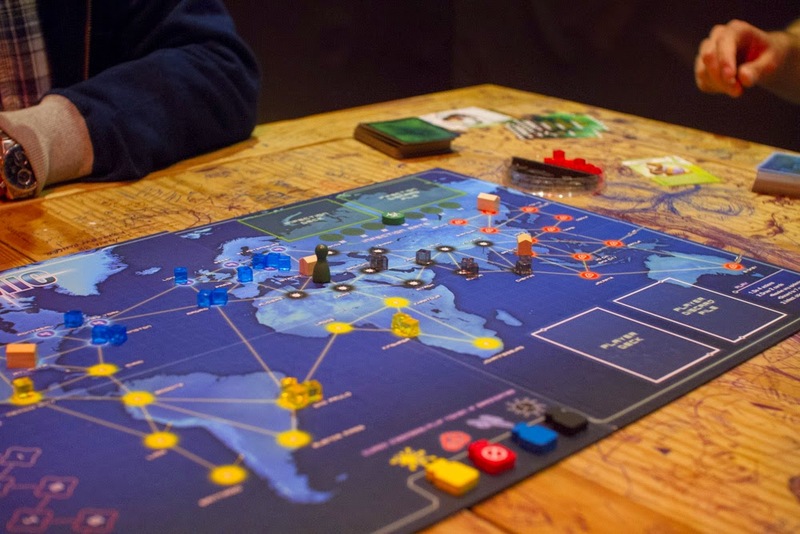 After Revolution, the guys went on to a game of Pandemic where they successfully cured all diseases, saving the world from infection. After Trains I played Love Letter, and everyone else finished up with Coup.